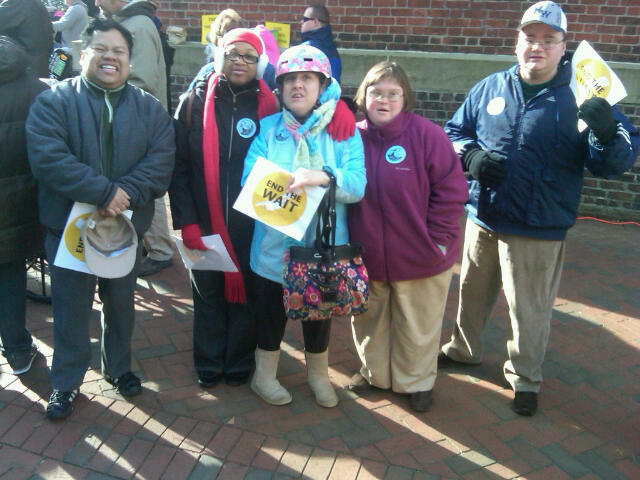 A group of self-advocates represented Didlake, Inc. at the Coalition for Mentally Disabled Citizens Community for All Rally in Richmond January 16. Self-advocates, pictured left to right, were Joseph Wage, Shameka Hannah, Kathy Weaver, Katie Kelly, and Vincent Jesionka. “It’s a tribute to the individuals we support, our staff and Didlake as an organization that we have self-advocates who can go to the capitol, meet face to face with their delegates and senators, speak for themselves and deliver a clear and purposeful message that is well received and appreciated by their representatives,” said Didlake Vice President for Rehabilitation Services John Craig. The group began the rally outside the General Assembly building on Capitol Square, followed by personal visits with senators and delegates. The attendees included Joseph Wage, Kathy Weaver, Katie Kelly, Shameka Hannah, Vincent Jesionka and Didlake staff John Craig and Donna Tucker.